Fitina: Once Abandoned, She Finds New Family in the U.S.
Fitina was a young woman when her parents abandoned her and her younger siblings. After surviving years of violent civil war in the Congo and witnessing “destruction, fighting, and killing everywhere,” she helped her family escape in the middle of the night. “We left only with our lives,” she says. After they fled to a Tanzanian refugee camp, her father left. A year later her mother left, too, leaving Fitina and her siblings entirely on their own. And she was only 24. During the 12 years they spent living in a tiny hut in the camp, Fitina became the guardian of her younger siblings. She also married and gave birth to her son. Soon after, her husband left her and their son. Through all this, she hoped that someday her family would have a better life. Meanwhile in Illinois, another family gathered. Last Christmas, Katie and Brent Rasmussen and their children heard stories of Brent’s mother’s life in a refugee camp during World War II. 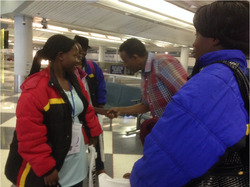 Those stories prompted them to help refugees today. A simple Google search led them to RefugeeOne and put them on a path that changed not only their lives, but Fitina’s, her son’s, and her siblings’. Katie and Brent learned about RefugeeOne’s co-sponsorship program, where a faith community, civic group, or family helps a newly arrived refugee family. Co-sponsors furnish an apartment and raise funds for the refugees’ first months in Chicago. The Rasmussens were eager to help, but the responsibility seemed overwhelming. That’s when they reached out to three other families in their community. To furnish the home, the four families gathered furniture and household items with help from their co-workers, faith communities, and neighbors. The response was amazing. Soon they had everything they needed and had raised more than $5,000, but they still had no idea who the refugee family would be. 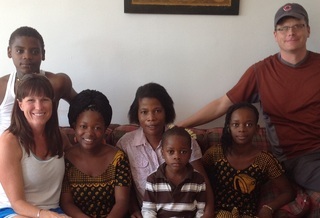 This summer, RefugeeOne told the Rasmussens about Fitina’s family and they quickly agreed to co-sponsor them. The next three days were a blur. Family members hauled furniture up three flights of stairs; others prepared a welcoming meal. The beds were made, cabinets were stocked with food, cleaning supplies, and games for the children, and pictures were hung on the walls. From the moment they arrived, RefugeeOne staff and the co-sponsoring families have partnered together to help Fitina and her family build hopeful new lives. Fitina works studiously in RefugeeOne’s English classes and is getting help from our employment team to find her first job. She is relieved to no longer worry about having enough food, and she is grateful for the co-sponsoring families who take turns visiting each week. They’ve taught her how to get to the local market, do laundry, and check the mail box, to name just a few things, and the children have loved meeting American kids their age. RefugeeOne’s summer camp was a highlight of the year, especially an unforgettable field trip to a high ropes course. Fourteen-year-old Rhoda, the youngest of Fitina’s siblings, overcame her fears in the tree tops and never gave up! Fitina is excited that her son and siblings get to attend school regularly for the first time. After enrolling each child in school, RefugeeOne staff now support Fitina at parent-teacher conferences, serves as liaisons with the schools, and tutor the children in our after-school program. Just before the children started school this fall, Katie and Brent helped Fitina get everyone ready. They made sure the kids had shoes, the correct uniforms, and school supplies. Katie reviewed vocabulary with the older children and the kids knew almost every word on the flashcards. Meanwhile, Fitina’s 6-year-old son, Gerome, played a memory game with Brent and laughed every time he matched two cards. “I am so thankful for RefugeeOne and my co-sponsor families,” says Fitina. “They showed kindness to someone they didn’t even know, someone from a different culture. They’ve helped us so much."